The PlaneWave Instruments CDK20 is a 20 inch (0.51 m) f/6.8 Corrected Dall-Kirkham Astrograph telescope. 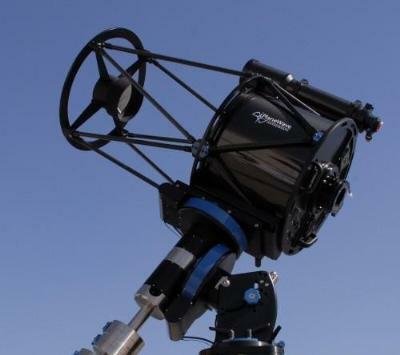 The CDK20 has a dual carbon-fiber truss design, with 3 cooling fans ejecting air from the back of the telescope. The CDK20 covers a 52 mm field of view without any field curvature, off-axis coma, or astigmatism. The instrument weight is 140 lbs (64 kg) and comes standard with the large capacity 3.5" Hedrick focuser. The CDK (Corrected Dall-Kirkham) Optical Design is an innovative solution for unsurpassed astroimaging quality at an affordable price. The CDK telescope design provides excellent imaging with large format CCD cameras while remaining superb for visual use. The CDK design far exceeds the off-axis performance of most commercial telescope designs including the Ritchey-Chrétien design. This no-compromise design is unique in making the optical alignment forgiving and collimation very easy. This guarantees the user the best possible performance from the telescope. The end result at the image plane of the CDK design is no off-axis coma, no off-axis astigmatism, perfectly flat field (no off-axis defocus). The CDK design will give you pinpoint stars from the center to the corner of the field of view. More about the CDK optical design. Heavy duty no-slip focuser. The focus tube runs on 5 bearings and is driven by a leadscrew so there is no chance of slipping. It accepts an optional dial indicator and PlaneWave’s EFA Kit to control many electronic accessories. The draw tube travel is 1.3 inch. Three fans blow out of the optical tube pulling air though the telescope and by the primary mirror. This helps the telescope to reach thermal equilibrium quickly. The fans are controlled by a switch on the optical tube or can be conrolled by a computer if the optional Electronic Focus Accessory (EFA Kit) is purchased. Adapts the 3.5" inner diameter of the focuser to a standard 2" inner diameter. This adapter is necessary when setting the primary to secondary spacing. The 200399 Visual 3.5" to 2" adapter is an optional accessory that is designed to space a 2" diagonal for visual use. This spacer is used for setting the primary to secondary spacing. It has an 1-1/4 inner diameter and may be used with 1-1/4 oculars for collimation. This ocular is a Ronchi screen used for setting the primary to secondary spacing. The Primary Mirror Cover protects the primary mirror. Click the button below to add the PlaneWave Instruments 20 inch CDK Optical Tube Assembly to your wish list.